Vice Admiral Karambir Singh has been appointed the next Navy chief. He will replace Admiral Sunil Lanba who retires on May 31. The Ministry of Defence announced the appointment on Saturday afternoon. Vice Admiral Karambir Singh, who hails from Jalandhar, supersedes Vice Admiral Bimal Verma, the Commander-in-Chief of the Andaman and Nicobar Command and the senior-most after Admiral Lanba. Service chiefs are normally appointed two months in advance. Admiral RK Dhowan had been appointed chief after the 2014 general election was announced. Ironically, he had also superseded Vice Admiral Sekhar Sinha. The BJP government did not go by seniority when it appointed General Bipin Rawat as the Army chief, overlooking Lt Gen Praveen Bakshi. Vice Admiral Karambir Singh is currently Commander of the Eastern Naval Command, Vishakapatnam. 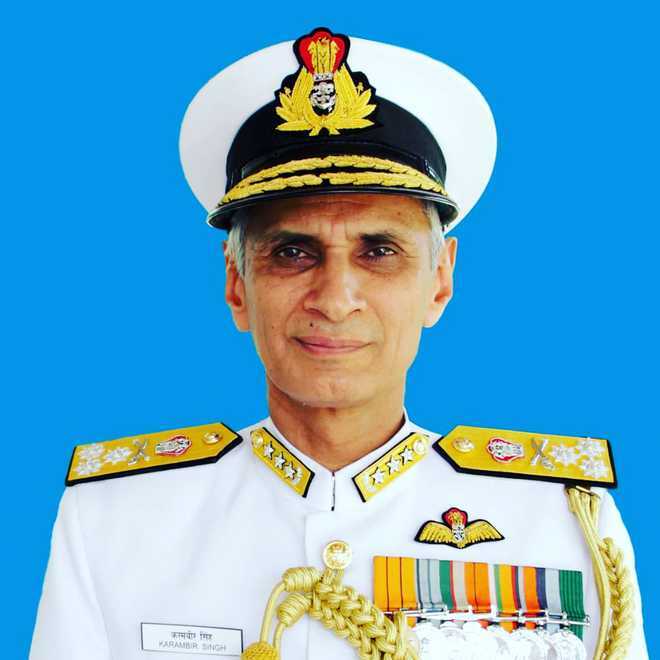 Commissioned into the Navy in 1980, Vice Admiral Karambir is an alumnus of the National Defence Academy. He earned his wings as a helicopter pilot in 1982 and has flown extensively on the Chetak and Kamov helicopters. He has been the Chief of Staff of the Tri-Services Unified Command at Andaman and Nicobar Islands and as the Flag Officer Commanding, Maharashtra and Gujarat Naval Area. Congress president Rahul Gandhi on Saturday paid tribute to freedom fighters Bhagat Singh, Sukhdev and Rajguru on their death anniversary observed as ‘Shaheed Diwas’ (Martyr’s Day), saying the spirit of revolution espoused by them is running in our veins. Gandhi said we will continue to fight the battle for their thoughts and ideals. “Bhagat Singh, Sukhdev and Rajguru are not mere names, they are the spirit of revolution running in our veins,” he tweeted in Hindi. 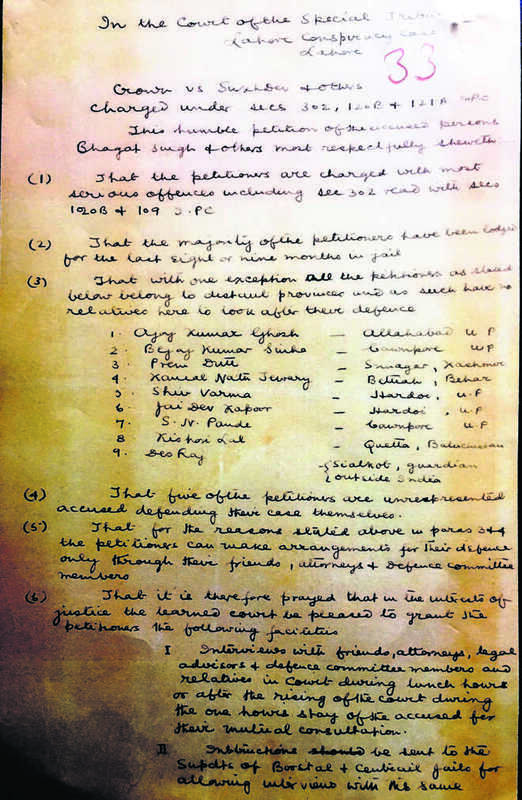 FROM PUNJAB ARCHIVES, LAHORE: Photographs of the letter written by Bhagat Singh and his comrades. A Special Tribunal of three High Court judges was notified by Chief Justice of Punjab High Court Chief Justice Shadi Lal, on May 1, 1930 for the trial of the Lahore Conspiracy case. This tribunal consisted of Justice Coldstream as President and Justice Agha Haider and Justice Hilton as members. 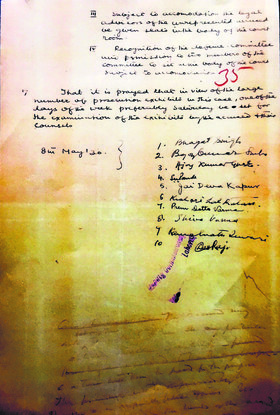 While on May 5, five comrades of Bhagat Singh wrote to the tribunal about their decision to boycott the tribunal, 10 other comrades, including Bhagat Singh, wrote on May 8, 1930, their response to avail themselves of legal help for the case. This letter had not been found earlier. But in March 2018, the Punjab Archives, Lahore, for the first time after 1931, put up an exhibition of a few exhibits from the over 100 files related to Bhagat Singh. Ammara Ahmad, a Lahore journalist, was kind enough to send the photographs of a few exhibits, including this letter. The Punjab Archives, Lahore, has claimed that it has now made all records of Bhagat Singh public and probably digitalised them also. It would be good if the Punjab Government in Chandigarh approached the Punjab Government in Lahore to share all records relating to Bhagat Singh and the records are put on display in Khatkar Kalan (Nawanshahr-Shaheed Bhagat Singh Nagar State Museum on Bhagat Singh). (2) That the majority of the petitioners have been lodged for the last eight or nine months in jail. (3) That with one exception, all the petitioners as stated below belong to distant provinces and as such have no relative here to look after their defence. 7. S.N. Pande — Cawnpore, U.P. (4) That five of the petitioners are unrepresented accused defending their case themselves. (5) That for the reasons stated above in paras 3+4, the petitioners can make arrangement for their defence only through their friends, attorneys and members of defence committee. II. Instructions should be sent to the Supdts of Borstal and Central jails for allowing interviews with the same. III. Subject to accommodation the legal advisors of the unrepresented accused be given seats in the body of the court room. IV. Recognition of the defence committee and permission to two members of committee to sit in the body of the court subject to accommodation. (7) That it is prayed that in view of the large number of prosecution exhibits of this case, one of the days of the week preferably Saturday be set for the examination of the exhibits by the accused and their counsels. With the Enforcement Directorate attaching the property of Kashmiri businessman Zahoor Ahmad Shah Watali in Gurugram, crackdown by authorities has begun on people and organisations suspected in activities of terror funding, especially in Jammu and Kashmir. The authorities in multi agencies moving in coordination are on the job after the National Investigation Agency (NIA) identified 12 others in the May 2017 case relating to the J&K terror funding. Watali is in Tihar jail since last year, sources in the government said today. Two other accused, Kamran Yusuf and Javed Ajmed Bhat who have been chargesheeted for their role in stone pelting and anti-India protests, are on bail granted by the trial court, the sources said. The government started seizing properties belonging to terror financers identified by the NIA with the Enforcement Directorate initiating action to freeze and seize such assets. Ongoing investigations in the first phase determined and quantified assets valued over Rs 7 crore as proceeds of terror-funding crimes. Watali, the sources said, is a major conduit for funnelling terror finances in the country and incriminating documents seized by the ED show he was receiving money from Hafiz Saeed, Syed Salahuddin, ISI and Pakistan High Commission at New Delhi and also known to have important sources of Hawala financing operating out of Dubai. Funds, the sources added, were made available to the leadership of Valley-based terrorist groups for providing the means to misguide and recruit local youth to terrorist ranks, including from madarsas and mosques. In addition, operational activities of terror groups were also being financed, including attacks on security forces personnel, their camps and convoys, the sources added. Money obtained through these channels was also being used by major secessionist formations, particularly All Party Hurriyat Conference (APHC), the source said, adding these funds were used to maintain top APHC leadership and to use propaganda machinery to arouse disaffection among people of J&K against the Government of India. In addition, the sources said the funds were used to spread false information through media contacts, newspapers and social media. In turn, these activities were used to instigate and lure misguided youth to resort to anti-India activities, violent street protests, demonstrations and stone pelting on security forces at encounter sites to foment further violence, the sources said. In addition, such funds were used to finance institutions focussed on subverting the local population through selected mosques, madarsas and organisations, including banned Jammat-e-Islami (J&K). The sources said in addition to Watali, 10 others under probe in the NIA case of May 2017 regarding funding include Hafiz Mohammed Saeed, Sayed Salahuddin, Aftab Ahmad Shah, Altf Ahmad Shah, Mohammed Nayeem Khan, Farooq Ahmad Dar, Mohadd Akbar Khanday, Mehrajuddin Kalwal, Bashir Ahmad Bhat and Nawal Kishore Kapoor, who is alleged to have remitted Rs 5.6 crore to Watali. Walking for miles to school across Shimla dales, drinking water at a flowing spring; pelting stones at some pear, apple, plum, fig tree and savouring the raw fruit; plucking a berry or some wild flower; admiring a farmer ploughing his terraced fields with a pair of oxen; giving a helping hand to a whistling shepherd to mentor his sheep and caressing his lamb are unconvincing stories for my grandchildren. It is no surprise, brought up as they are in modern cities, devoid of such heavenly benevolence. They go to school by car or bus, nor do they come across blossoming fruit trees. For them, fruits and flowers are only purchased from vendors; milk from a machine or a carton. They wonder at my confidence when I tell them that on the very first day of my school, in 1952, I walked back home to my mother’s utter surprise as she failed to pick me up. Appreciating my initiative, she showed no signs of worry. 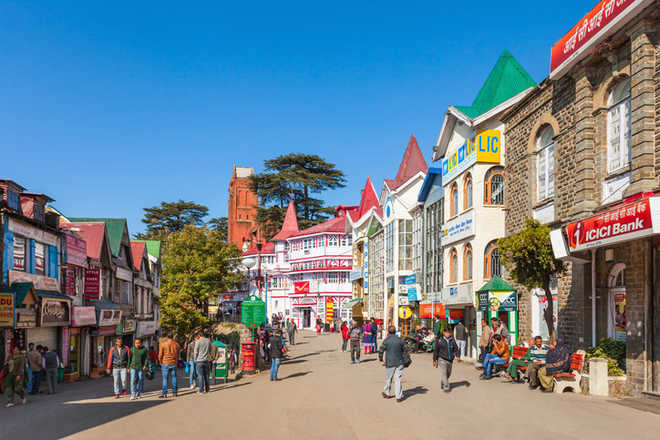 Shimla was a peaceful, walker’s paradise, then — no traffic hazards; people along the way knew us and children were considered safe everywhere. Today, children wear identity cards, carry mobiles and are collected from school by guardians as a ritual. They do not believe that I used to venture out in severe winter, wearing heavy woollens knit by my mother, to enjoy the soft snowflakes on my face; making a snowman and snowballs to hit friends and siblings with! For them, snow may be fun, but shortlived — only during holidays, that too if luck favours it. They go to sleep while watching cartoons on TV, whereas for me it was the melodious ringing bells of the mules passing by our house or, at times, the deafening growl of a leopard or a barking deer not far away in the jungle. Sundays meant a picnic, walking to Glen, Annadale, Naldhera or Mashobra for juicy apples and peaches etc. The ‘Big Ben’, mall road, Ridge, ‘Scandal Point’, and Gaiety Theatre were where we would cross path with dignitaries like Dr Rajendra Prasad and Marshal Tito. After a tiring walk, there would be a feast of bhutta, doodh-jalebi or puri-bhaji at Mehru and Nathu halwai. For the kids now, it is malls, pizzas and burgers. The heart laments — koi lautade mere beete hue din, that often lure me to the now-flattened hills of my childhood — sans pristine beauty. All that one sees now is dying pines and deodars; drying chashmas, concrete jungles, noisy traffic, pollution, growing population and nobody shaking hands with a tourist. Shimla is as bad as other cities where grandchildren live, rendering it worthy of their taunt and unworthy of a melodious story anymore. The significance of the Balakot airstrike will wane if the gains do not lead to stabilisation of the turbulent internal security scenario in Kashmir. The stress and strain on national security from LoC intrusions or airspace violations are not as complex to deal with as the internal security stress arising from tackling the Kashmir unrest. Flawed: The Balakot episode has confirmed that the predominantly national security approach to the Kashmir issue is fraught with the danger of war with Pakistan. NEED we view separately the Pulwama and Balakot incidents? The two seem cause and consequence; the sheer magnitude of the Pulwama attack shocked the nation and culminated in the Balakot bombing; the expanse of India’s political and diplomatic response against Pakistan was extended to include economic sanctions and military strikes. However, there is no denying that keeping the peace in Kashmir has continued to be as arduous after Balakot as it was before Pulwama. Simply put, the internal security dimensions need a fact check independently too. According to an old aphorism, a specific racehorse may perform differently depending on the course on which the race is held. The laws of operational surprise are supportive of a small and swift profile. These could be seen, on the fateful day in Pulwama, arraigned against the vast target of slow-moving CRPF convoy of vehicles. ‘Horses for courses’, or lack of clarity thereon has again proved to be the nemesis of our internal security policy-makers. Both the Ministry of Home Affairs (MHA) and the office of the National Security Adviser (NSA) have so far refrained from making any exclusive statement explaining the Pulwama attack. Both are operating without the services of credible advisers in the field of internal security. Based on national interest perceptions, the profile of a border between two countries may be offensive, defensive, restrictive, facilitative, neutral or a combination of such orientations. Or, like the Indo-Pak border, the picture may be an amalgamation of all possible shades. From the adrenaline-pumping Retreat ceremony at Attari-Wagah to surgical strikes in terrorist-infested stretches, from the Lahore bus and Samjhauta Express friendship journeys to the smuggling of jihadis and armament under intensive fire cover, from trade and religious corridors to hi-tech barriers, it is a strategic map drawn along the contours of peace talks and war histories. The story has gone on too long, inconclusive and uninterrupted. From the national security angle, it was only waiting to be announced that India, too, had added a third-dimension border perspective to the conflict over the Kashmir issue. The highly publicised Balakot airstrike in response to the Pulwama terror attack was exactly that. Since the Simla Agreement, the two countries officially acknowledged the existence of a two-character border in Kashmir: International Border (IB) in the settled area and the Line of Control (LoC) in the claimed area. Pakistan, or rather the Pakistan army, in due course, managed to push terrorism wider and deeper into Indian territory and supported it as the third character of the hostile border. India paid them back regularly through its intelligence and security operations, and now with the Balakot strike, the third dimension in its border response has been formally unleashed. The significance of the Balakot strike, however, will wane if the gains do not lead to stabilisation of the turbulent internal security scenario in Kashmir. The stress and strain on national security from LoC intrusions or airspace violations are not as complex to deal with as the internal security stress arising from tackling the Kashmir unrest. While the Balakot air response is a typical ‘horses for courses’ lesson for Pakistan, the Pulwama attack is to be bracketed as a suicidal setback, the result of a long-term faltering of political will to apply this time-tested strategic doctrine in limiting Kashmir militancy. Here the familiar sequence of events cannot be lost sight of: Pulwama preceded Balakot, the internal security catastrophe leading to a national security situation. It was made to look like a compelling threat of war between nuclear neighbours over an operationally avoidable tragedy! Let us count the types of hostile borders and lines of control that presently divide Kashmir from the rest of India. The status of Masood Azhar as a global terrorist is one of the foremost issues on the mind of a nation kept obsessed with the national security threat from Pakistan. Either way, though, it would resolve nothing in Kashmir. In contrast, lying uncertain is the relevance of Kashmiri nationalism, which is based on a special status under Article 370 of the Constitution and is equated with deshdroh under the compulsion of supremacist majoritarianism. Simultaneously, it seems Kashmir is destined to be policed differently from the rest of India, by the Army and CRPF. Instead of integrating the trust of a civil police system in day-to-day affairs in Kashmir and using the CRPF as a subsidiary armed support against militants, there is an offensive reliance on strengthening the boastful presence of the Army and the CRPF. There exists, therefore, a visible ‘LoC’ between the Indian Army and the Kashmiri people. The Balakot episode has confirmed what the Kargil conflict, coming months after the Lahore peace declaration, had warned about, that the predominantly national security approach to the Kashmir imbroglio is fraught with the danger of war with Pakistan. Irrespective of India’s insistence on bilateralism, this approach can at best hope to bag a geo-political solution in the long run. It presupposes strong diplomacy and a capable military — and India boasts of both. A predominantly internal security approach will require bipartisan politics and statesman-like leadership; India has none at present. It is perceived that Atal Bihari Vajpayee and Pervez Musharraf had almost resolved the Kashmir dispute at the Agra summit in 2001. I was a witness to both leaders looking disappointed at not signing the prepared draft. However, the fragility of such a document could never have been in doubt. Parliament was attacked in December that year by Lashkar-e-Taiba and Jaish-e-Mohammed, two Pakistan-based terrorist organisations, resulting in a prolonged standoff. Even the much-referred Vajpayee peace doctrine of Kashmiriyat-Jamhooriyat-Insaniyat, testimony to his statesmanship, will have no chance to grow in soil kept infertile by the manure of outdated internal security. Lack of empathy and understanding of an operational requirement due to bureaucratic procedures and attitudes is a cause for concern. In any other country, where the political and bureaucratic climate is cognisant of military urgencies, many heads would have rolled. Imperative: Hard power, in quality as well as quantity, is the key to building deterrence to avert future Pulwamas. THE Pulwama and Balakot incidents have pushed into the background the report of the Comptroller and Auditor General (CAG) on the Indian Air Force (IAF) acquisitions, of which the Rafale deal hogged the limelight. Despite the favourable Pulwama end state being achieved, albeit temporary, there is an imperative that needs urgent government attention. Tucked away in the CAG report is a cry beseeching a look into what one may call ‘defence distress’, paraphrasing the term from the agrarian and farmers’ distress that every politician is talking about. The last two are vote banks which no politician can be reticent about, as they are leveraged through morchas, hartals and strikes. Unfortunately, when defence distress strikes, it is deadly, and often ‘fatal’ in a way. The Balakot incident demonstrated resoundingly that India has had enough of Pakistan’s support to terrorism; however, it should not divert our attention from the fact that defence pangs are a reality and the tell-tale signs should be recognised and acted upon. There are three pointers that need elaboration; though IAF examples are discussed, the issues are valid for other defence forces too. Critiquing sub-optimal defence procurement procedures, CAG has commented that the non-conclusion of a usage contract precluded the use of the flight simulator for the C-130 Hercules aircraft till 2016, despite it being ready four years earlier. In the interim, India lost five air warriors and a multi-million-dollar aircraft in 2014, attributed to a training issue. This is the first pointer — lack of empathy and understanding of an operational requirement due to bureaucratic procedures and attitudes (remember, the simulator was fully ready). In any other country, where the political and bureaucratic climate is cognisant of military urgencies, many heads would have rolled. The second pointer is of an intangible kind, which, if neglected, shows up with deadly results later. The HAL-built HPT-32 trainer was grounded in 2009 after many accidents, 13 of which were fatal. Many red flags had been raised about the stone-like gliding quality of the HPT after an engine failure (a frequent occurrence). The IAF had pulled along till the proverbial straw fell on the camel’s back and we lost two flying instructors at the Air Force Academy (AFA). The HPT was grounded, throwing the training profiles of rookie pilots into bedlam, and for the next few years a sub-optimal training pattern on the HJT-16 Kiran was followed. The emergency purchase of the Pilatus aircraft revolutionised training; AFA’s flight line was chock-a-block with the gleaming new trainers till 2017 or so when, due to non-finalisation of maintenance contracts, a severe lack of spares ensued. This is the situation even now, as per media reports. However, training has to continue to ensure a regular pilot feed for frontline squadrons and one is sure that cannibalisation (shifting) of spares among aircraft is being done and extension given to parts whose life is expiring. The situation must be similar for some other fleets, too, as many acquisition and upgrade programmes have been inordinately delayed, a fact stated by the Air Chief last month. This unacceptable situation is the second indicator of a serious problem, where lack of funds could be pushing reliability of war- fighting equipment towards an unsafe zone, which may translate into tragic results later. The third warning is where op-preparedness starts getting affected. Under-equipping of the Indian Army was one of the major causes of the 1962 China debacle. At a recent conference, tears welled up in a retired Lt General’s eyes while narrating the humiliation the armed forces had felt then. “Thank God for the subsequent 1965 Indo-Pak war that brought back some self-respect,” remarked the General. After 1962, the government funded an accelerated re-equipping plan and the victory in the 1971 war bears witness to that effort. 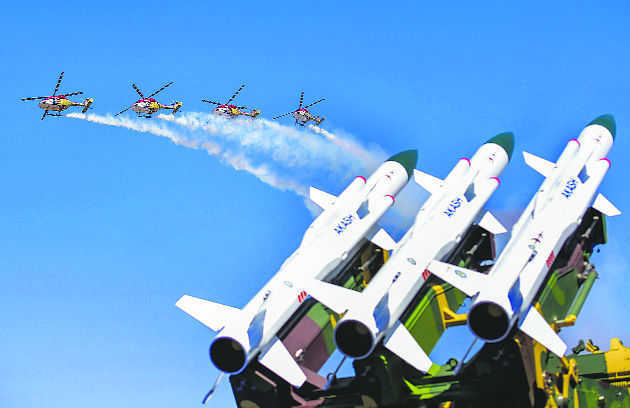 However, as per recent media reports, we are on the downslide again with a shortage of fighter squadrons and many critical items; soldiers’ rifles are having to be imported by the fast-track route, ammunition is in short supply, and sniper rifles, Naval helicopters and MiG-29 fighters for the IAF are planned to be imported too. But will these just remain plans, as this year’s defence acquisition budget is insufficient even for previously concluded contracts? Answers to these pointers have a bearing on what happens hereafter. History shows that adversaries cannot be reformed as per one’s wish but have to be coped with through management strategies in which hard power is vital to prevent blackmail. Addressing defence concerns (though not a vote catcher) is an imperative first step to ‘manage’ Pakistan and simultaneously weigh against China. While short-term responses after the Pulwama attack will be implemented, long-term solutions require tons of money and decades of time spread over many governments. Of the three attributes that determine deterrence to prevent blackmail — resolve, capability and capacity — the Balakot incident demonstrated the first two; the third, dependent on an indigenous arms base, is in short supply. Politicians of all hues need to put their shoulders to the wheel and address defence preparedness in a bi-partisan manner — indigenous defence R&D and manufacture must be kickstarted. Hard power, in quality and quantity, is the key to building deterrence to avert future Pulwamas. Can every political party elaborate, in its election manifesto, what it would do to address defence preparedness? That would indeed be welcome. Air Commodore Ajay Singh Pathania took over the command of the Jammu Air Force Station as the Air Officer Commanding (AOC) from Air Commodore SK Mishra today. On this occasion, an impressive ceremonial parade by the Air Warriors was held at the Air Force Station in Jammu. Air Commodore Pathania was commissioned in the Indian Air Force in 1986. An experienced flying instructor and a graduate of Defence Service Staff College, the officer has flying experience of about 6,000 hours on helicopter and trainer aircraft in India and abroad to his credit. He has been the Flight Commander of three types of helicopters and commanded two types of helicopter units, which includes Chetak/Cheetah in the eastern sector of India and MI-25 in UN mission in the Democratic Republic of the Congo. He has been the Chief Operational Officer of a premier IAF base and also commanded a Tactical Air Command in the eastern sector. The officer has also served as personal and operational staff at Air Headquarters. He was directly involved in major humanitarian assistance and disaster relief helicopter operations between 2012 and 2015, including in the Kashmir valley, Jammu and Uttarakhand, etc. He was instrumental during the rescue and relief operations after the Nepal earthquake as well as the Yemen evacuation in April 2015. He has been the AOC and President of the Air Force Selection Board at Kolkata (Kanchrapara) and Dehradun. He was awarded the Chief of the Air Staff commendation in 1995, AOC-in-C HQ Training Command commendation in 1997 and the Vishisht Seva Medal in January 2015. 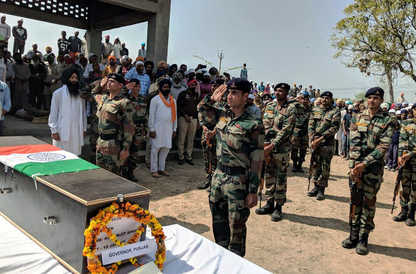 Rifleman Karamjit Singh (24), who was killed in a ceasefire violation along the LoC in Rajouri district of Jammu and Kashmir, was cremated with state honours at his native Janer village in Dharamkot on Tuesday. District Magistrate Sandeep Hans accompanied by SSP AS Bajwa laid a wreath on the behalf of Punjab government, while Captain Gokul Ashok from the martyr’s 18 JAK RIF regiment paid tributes on the behalf of the Army. Hundreds of people, who came from different parts of the district, gave a tearful adieu to the martyr. Karamjit’s coffin, draped in Tricolour was brought to his home in the presence of senior Army officials. As Karamjit’s father Avtar Singh and elder brother Swaran Singh lit the pyre, a contingent of the Army gave a gun salute to the martyr. Local MP Prof Sadhu Singh of AAP, local MLAs Kaka Sukhjit Singh Lohgarh and Dr Harjot Kamal and senior Akali leader Jathedar Tota Singh were also present. The Indian Air Force (IAF) is lately dealing with a new surge of emotions, from its own retired personnel who wish to fight for the nation. 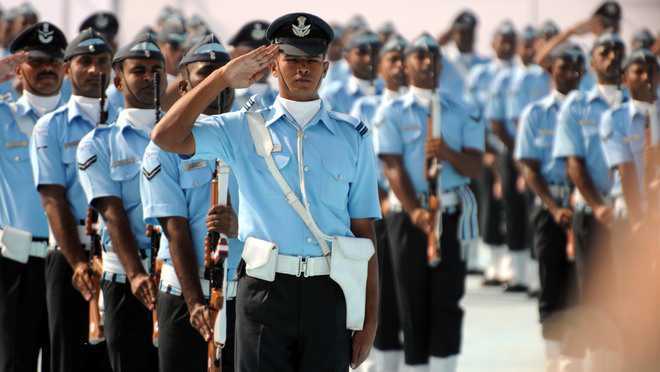 The IAF mailbox — email and normal mail — is flooded with requests from retired officers and airmen offering their services to the IAF, fearing the country may face some “exigency”. Sources say retired fighter pilots, helicopter pilots, engineers and airmen (IAF nomenclature for jawans and JCOs) have sent in mails detailing their expertise along with rank, name and number held during service. All of them have offered to leave their existing jobs and enterprises and work for the Indian Air Force. The mails have been trickling in since the air strike at Jaish-e-Mohammed’s Balakot terror camp in Khyber Pakhtunkhwa on February 26 and subsequent air battle over Nowshera/Rajouri in Jammu and Kashmir on February 27 when Wing Commander Abhinandan Varthaman ejected in Pakistan-occupied Kashmir. While the IAF has not accepted any such request, retired personnel are all in, apparently feeling that the Air Force may need manpower to monitor ground stations, radars, sensors and warplanes would need to be “hot-serviced” for a quick turnaround. All of them are trained men. Normally, if an exigency arises, the duties would entail ground operations, managing logistics and back-end administration. Old-timers recollect a similar surge in emotions during the Kargil conflict of 1999. The IAF, on its part, has war-gamed its manpower needs in case of an emergency and conducted a pan-India exercise “Gagan Shakti-2018” from April 8-22, 2018, to validate it. The exercise was real-time coordination, deployment and employment of air power in a short and intense battle scenario. During the exercise, more than 11,000 sorties were flown.